Flip Out Mama: Homeschool Moms, Teachers, Take Note... Introducing the BEST Pencil Sharpener EVER! Homeschool Moms, Teachers, Take Note... Introducing the BEST Pencil Sharpener EVER! As another summer comes to a close, and we are all focusing on (or trying not to focus on, depending on what day it is!) the start of the school year, everybody is making lists, and figuring out what they 'must have' for the new school year. For me, I knew one of the things on my list was a GOOD pencil sharpener. I have bought a ton of pencil sharpeners over the years, mechanical ones, electric ones, any I could find, and none of them were any good. I have spent so much money on pencil sharpeners, and I know that with our first year of homeschooling starting up, we will be sharpening more pencils than ever! SO, I had to find a good one! Classroom Friendly Supplies has raised the bar when it comes to pencil sharpeners, and their Classroom Friendly Pencil Sharpener has teachers everywhere raving!! Not only is the Classroom Friendly Sharpener quiet, it is also incredibly durable and sturdy. It is easy to use, and it stops automatically after the perfect point has been made. No more worrying about the kiddos sharpening the pencil all the way down! 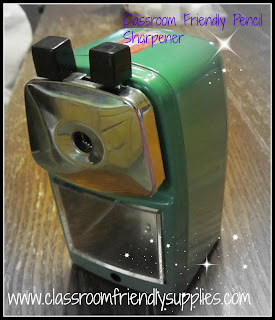 We were really excited to try out the Classroom Friendly Sharpener, and we have been giving it a bit of a test drive over the summer while we are gearing up for our school year. I have to say, I LOVE this pencil sharpener!! I am only sharpening pencils for two kids, so I can imagine how much of a lifesaver this thing would be for someone who is sharpening pencils for 20 or 30 kids! I love that the Classroom Friendly Sharpener has the convenient little pull out tray so you can easily dump out all the pencil shavings without creating a huge mess! 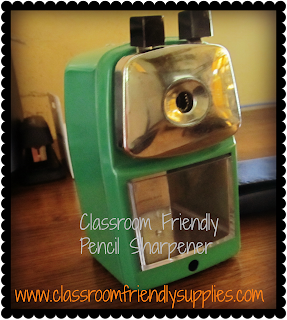 I love, love, LOVE this pencil sharpener, and I totally recommend it for moms and teachers alike! The pencil sharpener comes in groovy green, cool blue, firehouse red, and midnight black. The price is great at $24.99, and if anything on the sharpener breaks, you can order replacement parts instead of buying a new one, and save even more money! 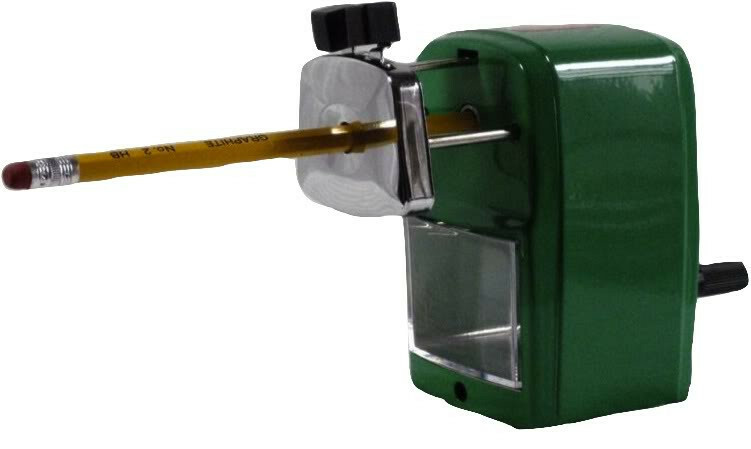 To order a Classroom Friendly Sharpener of your own, just visit the website! I received a sample pencil sharpener in order to conduct my review. All opinions are 100% my own, and are never influenced by outside means.